Most people’s experience with AR ends with Pokémon Go, which hardly shows the technology’s potential. This demo gets closer, taking advantage of Apple’s ARKit framework to add a convincing sense of depth and presence. In Singh’s demo, your virtual brawlers duke it out in the actual streets or on a tabletop. The game size scales with a simple slider at the bottom of the screens. When scaled up to life-size in AR, each punch, kick or jump carries an extra sense of weight. At tabletop size, it’s more like playing with animated action figures. But even then, the shift from two dimensions to three feels profound. Instead of sharing a screen, gamers stand facing one another on opposite sides of the characters, playing through their respective iPhones. 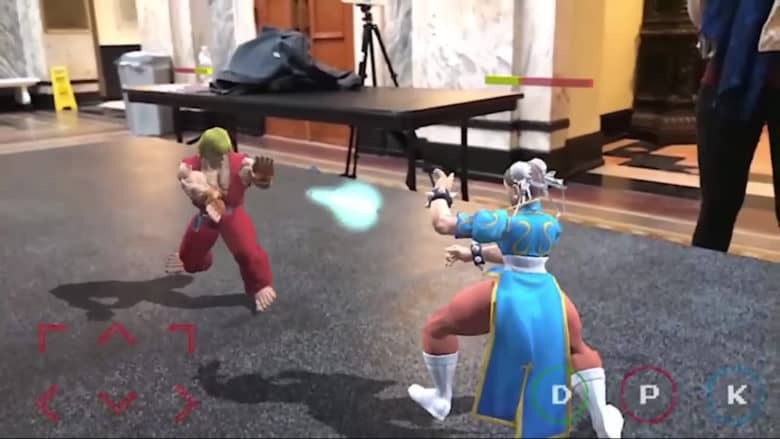 Playing Street Fighter this way offers a “really nice Mexican standoff kind of vibe,” Singh said. This suggests some of what we can expect in the near future of gaming — virtual play that takes place in real space. Suddenly the familiar Street Fighter characters developed by Capcom in the 1980s have a sense of presence. You can walk up to and around the fight from any angle. 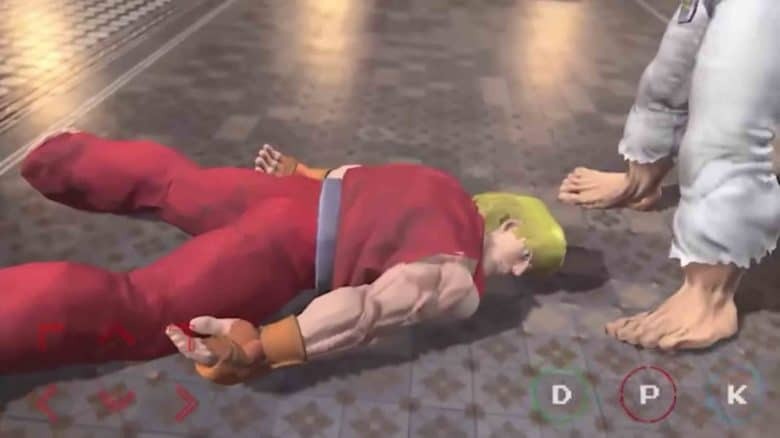 Take a good close look at Ryu as he lies panting after a bout with Ken. Or set the car to be demolished during a bonus round in an actual parking spot. The gameplay in Singh’s demo is miles from the fine-tuned pace and intensity of the original. A helicopter kick moves more like the second hand on a clock than a tornado. And playing a classic button-masher on a slick iPhone surface will always make for a messy translation. But this is just a demo, after all. And as a concept and a vision of things to come, it really gets the imagination going. This demo shows how surprisingly immersive even classic games can be in AR. AR technology is maturing fast, and nostalgia is a surefire way of getting people’s attention. So we undoubtedly can look forward to plenty more immersive reimaginings of our favorite games. As developers work out kinks in positioning, controls and other areas, new kinds of games that many of us can’t even imagine yet will start to emerge. Meanwhile the lines between the physical world and our digital activities is going to continue to blur. Video games, even the classic ones, are clearly going to play a prominent role in that shift. Just last week, users of Google Maps could drive home like they were playing Mario Kart. For all the sprawling, visually stunning video games we take for granted today, titles from the ’80s and ’90s still get people excited, and for good reason. Those classic games made the most of the era’s limited hardware to create gameplay, character designs and music that proves timeless. They make great source material for experiments on new platforms. For his part, Singh seems to have a knack for AR projects that click. His augmented reality cat and laser pointer app recently made the rounds online. And last year, he ported another console classic to augmented reality: Super Mario Bros.
As for the Street Fighter II demo, Singh doesn’t rule out punching it up even more. Posted in: News, Newsstand, Top stories Tagged: Abhishek Singh, ARKit, augmented reality, gaming, n2, Street Fighter, super mario bros.